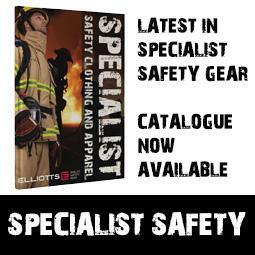 Elliotts are a successful manufacturer and supplier of quality safety gear throughout Australasian markets. Our reputation for care has been built over 40 years with a dynamic and positive spirit to do the right thing by our customers, staff and industry that sets us apart from others and drives us to deliver the most innovative safety and care products available. You can be completely confident that everything carrying our name can be relied on to take care, because we have taken the care to get it right. Our passion for quality and reliable service is matched by world class partnerships and a never-ending quest for the most innovative safety and care technologies available, wherever they are and before you know you need them. Get your copy of the Specialist catalogue by calling Elliotts Customer Service on 07 3265 2944 or click here to order your copy online. Elliotts quality Personal Protective Clothing (PPC) and Personal Protective Equipment (PPE) are proven on-the-job every day. They are specified routinely for and by workers in metal, petrochemical, mining, emergency services, construction and other industries where hazards exist. These reliable and popular products are part of a comprehensive range evolved over time and based on the common foundation of quality and care for which the Elliotts has built its reputation. Elliotts is a quality endorsed company with many of its products certified to specific standards applying to protective clothing and equipment. This means our customers are guaranteed superior product performance across our entire range. It also means that workers use our products with confidence and peace of mind. Elliotts quality safety gear allows you to take care in any situation. Elliotts is an Australian based designer, manufacturer and distributor of world-class quality safety gear servicing the Australasian market. Elliotts take care to only supply quality protective clothing and equipment that protect people from harm on a daily basis. Products include Specialist Safety Apparel, Welding & Workshop Protection, Gloves & Hand Protection, Safety Workwear & PPE for workers across industries including ELECTRICAL, MINING, OIL & GAS, WELDING & METAL FABRICATION, ALUMINIUM SMELTING, FIRE FIGHTING, CHEMICAL MANUFACTURING & CONSTRUCTION. For more information visit www.elliottaustralia.com.